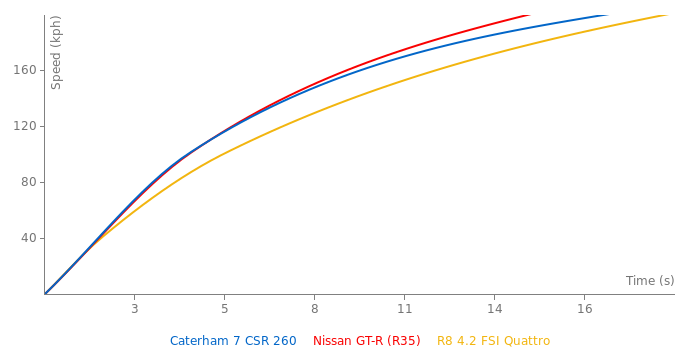 0-60 times for the CSR 260 typically vary by 0.5 seconds because the 1st to 2nd gear change occurs near 60. Variation is affected by tire wear and the setting of the rev limiter at or slightly under the 8,000 RPM red line. There is less variation in the quarter mile time of around 12 something seconds. 1st gear goes takes you to 60. 2nd to 80. 3rd to 100. The quarter mile is complete before 4th gear runs out at 120. 5th is good for 140 and 6th is drag limited around 155. This link shows a 9 minute video taken and posted by a passenger in a CSR 260 driven by its owner on a track day at Nelson Ledges Road Course. I guess thats the second lap on the list??? 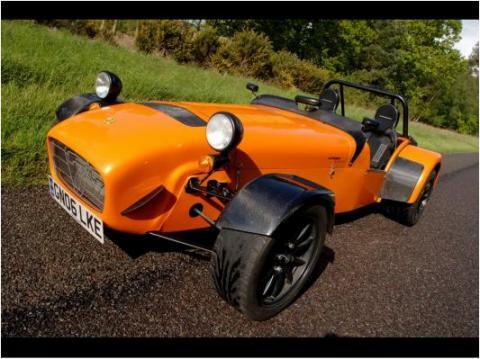 Top Gear Track 1:17.4 - Caterham 7 CSR 260 sponsored by Dunlop - Injection, driven by Rob Jenkinson. ^^ It also depends on the source. For example suppose an American magazine tests a car 0-60mph and on that day, on that surface, etc. it turns a 3.1 sec time. Then another magazine tests the exact same car at a different surface and records a 3.8 for 0-100kph. Depends if a gear change happens between 60 and 62mph.... that can easily add half a second. not a go kart and doesn't have power of a mustang, get it right. nice! the power of a mustang in a mini go-kart! Obviously, time 0-200 is wrong. y is it not back at 3.1 0-60? Not sure on a couple of things on this one..... the CSR 260 is a current model not from 1957? EVO have the 0-60mph time as 3.9 rather than 3.1 quoted here. The Bedford Autodrome laptime from EVO is actually the CSR260 Superlight version. What is the quarter mile time then? Quarter mile time is wrong!